We had an amazing three days joining in with Loving Lodge Lane last week. Spread over 3 days, Loving Lodge Lane focuses on the three council wards that border Lodge Lane (Greenbank, Picton and Princes Park). Each day focussed on a different ward. On Wednesday 18 June, we attended the event at Cullen Street in Picton ward and helped out where we could. The weather wasn't that great but that didn't stop everyone having fun. We also partnered up with Liverpool Adult Learning Service using their mobile learning centre to encouraged people to have a go at looking online to find healthy recipes with a Click and Cook competition where people could win a hamper of fresh fruit and veg. Day 2 was at Fern Grove Garden in Greenbank ward and there where lots of different things to do. From Poet's Corner to healthy recipes from Happy Go Cooking and the Click & Cook competition. L8 Living Sustainably were also encouraging people to have a go at growing and we gave away some hanging baskets and herb troughs to get people started. We were also on hand to provide some growing tips and advice. The final day was held in Princes Park ward. We started off the day by helping out Liverpool Mutual Homes on their impact day on the Coltart Road estate and we also provided some of their residents with strawberry and tomato plants. The day continued at the "Bath site" at the top of Lodge Lane with a family fun day. 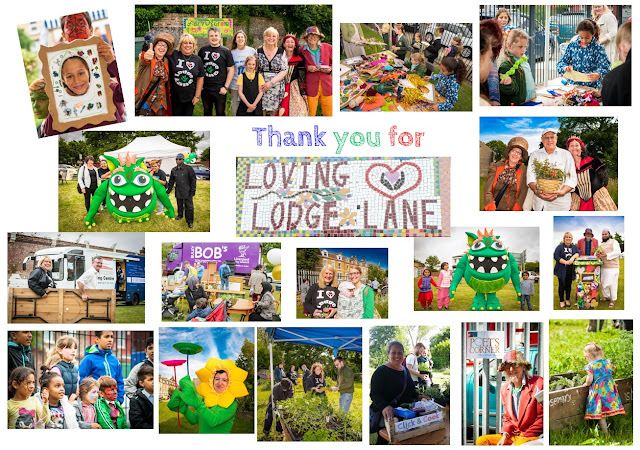 Bulky Bobs were giving away free furniture, the Loving Lodge Lane recycling monster was there and again the L8LS team where giving away edible and floral hanging baskets. It was a wonderful three days that proved to be a fun positive community experience for all!